Freeline Skates™ are ridden skateboard / snowboard-like. Riders can achieve high levels of traction and carve smooth "S" turns while riding downhill and dance like a fish on the flats and uphill. 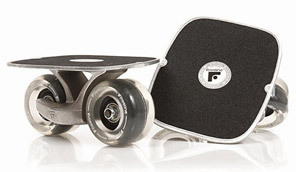 Freeline Skates™ are extremely portable making them the smallest and lightest form of transportation.